In such case Part Z Work Offset will represent the distance between the same Gage Line to the top of the part. Tool Length Offset remains the same between many machines. You can just pull the tool out of one machine, Put it into the other one, Type in its Tool Offset and off you go. There is no need to touch of the tool again. Positive offsets are the easiest to wrap your head around. Each definition represents exactly what it does. Positive Tool Offsets can be measured offline on a pre-setter and then tools can be quickly loaded into the machine without the need to tough off each tool on the machine individually. If your tool pre-setter goes down (who never had a dead battery?) you will have hard time trying to touch off your tools the alternative way. In summary. Positive or Gage Line Tool Offsets are practical on modestly to highly standardized/automated machining environment. Negative Tool Offsets are dead-simple. In its easiest form it represents the (negative) distance between the tip of the tool to the top of the part. 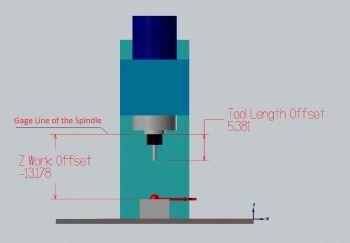 This Tool Offset setting style is often used on older machinery in non-automated or non-standardized machining environments. The initial Top Of Part flat surface is often faced and filler gage is used to set the tool of the top of it. Dead-simple. Tool Offset represents the distance between the top of the part and the tip of the tool. This Tool Offset setting style is supported by default on most machines. Just jog the tool to the Top of Part and press "Write Offset"
Can not set tool offsets off a curved or irregular surface: Imagine you need to rework an already machined part. How will you set the tool heights? You can, however, have a little bit of both worlds. If your machine is not equipped with an automatic tool pre-setter and you have to use your machine's manual tool offsetting routine. You can Touch Off all your tools of a pre-defined gage block off the top of your table or ground vice surface. In this case Z Work Offset will equal the distance between the top of the touch-off gage and the top of your part. It is extremely handy to touch off your tools of the solid vice jaw using a 1x2x3 block or a special analog Tool Probe with a dial scale. Just make sure to use the same height (for example the 2 inch side) all the time. Because when machining in vise the part stick-out is the most important value, it is easy to calculate the proper Z Work Offset height. All you have to go is set your Z Work Offset to -2.0 (in case when you tough your tools 2" above the top of the jaw) and then add the height of your part above the vice. Same tools can be used without the need to re-set their Tool Offsets between jobs. Only your Z Work Offset changes. This Tool Offsetting Routine is supported by most CNC machines. No need to face the top of your part to set your tools or work offset. Just calculate the distance between the top of the gage and the top of your part. A tool pre-setter can be used to set the tool offsets. You would need to supply the Machine Gage Height value to the pre-setter software to calculate the proper Tool Offset value. Math involved can be a bit challenging at first. Thus not many beginning machinists use it. Tool Offsets will be different between different machines. So they need to be touched off when machine is switched. Which Tool Offset Setting Type to Use in Your Shop? It depends on your equipment and shop practices. You should, however, stick to one particular Tool Setting style and use it across the shop to avoid machine crashes and mishaps.